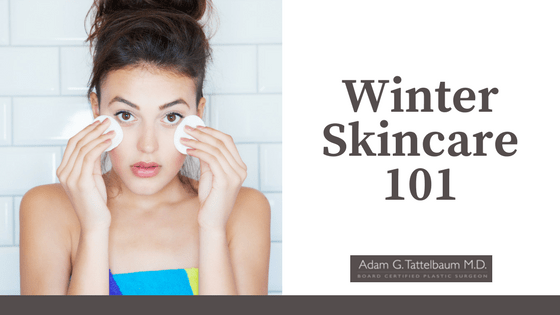 Winter Skincare 101 - Adam G. Tattlebaum M.D. Here in Rockville, Maryland, the average low temperature is 24 degrees in January. The winds are already blowing, and the wintry mix could make us all miserable. As a trusted Maryland plastic surgeon, I want to help you look good all year round. Keep reading for more tips on how to take care of your skin during winter. Many people think that staying hydrated is only important in the summer. While it is important to keep hydrated when you are sweating, it is just as vital to drink water in the winter. You are not losing as much water, but you are still losing water. Water helps you maintain elasticity in your skin. The stiff winter breeze can make your skin dry out and appear cracked, but more importantly there are other adverse health effects that may occur. You should cover up, but also make sure that you are consuming enough water on a daily basis. This seems a bit paradoxical. The Sun shines brightest in the summer, and everyone knows that. You should keep in mind that up to 80% of the Sun’s UV rays go through clouds, and windows only shield you against UVB rays, and not UVA rays. You can get exposed to quite a lot of sunshine in the car. Many people choose to commute to DC from either Rockville or McLean. If you do so, it may be a good idea to apply some sunscreen, so you can feel better while you drive along the beltway. When the nights are cold and long, many people love toasting marshmallows by the fire. While you sit by the fireplace, you should be careful that you are not toasting yourself. Resting too close to the fire can result in erythema ab igne, which can leave the skin discolored. It may be a good idea to sit a bit back from the fire. In addition, taking long hot showers or sitting close to the fireplace for prolonged periods of time can severely dry out your skin. This is another reason you should sit a few steps back. In winter, our lips take a beating. The wind can buffet them and make it painful. You should not lick your lips. It is a natural reflex to want to lick them when they are dry. Keep in mind that even if it feels like you are keeping them moist, it can make your lips more prone to drying out after a while. It may be a good idea to invest in lip balm. If you can find an ointment-based lip balm, that would be ideal. Camphor, eucalyptus, and menthol can dry out your lips, so it may be a bad idea to use lip balm with these ingredients. As soon as you see a crack, you should try to take care of it. Something a bit unconventional you can try involves having fillers done. Certain fillers, like Juvederm, can last for 9-12 months. This can give you a head start on looking good for the spring and the summer, when people start going out and about. If you have any questions about how to make your appearance glow, contact us today. Adam Tattelbaum is a responsible, respected, and resourceful Maryland plastic surgeon. Call us today at 301-656-6398.